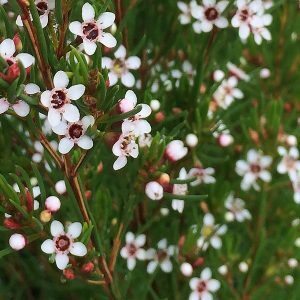 Best grown in a sunny position in a well drained soil, Chamelaucium floriferum is a drought tolerant evergreen plant from Western Australia. Attractive white flowers with deep red centres cover the plant in spring. The species itself will reach around 2 metres in height, cultivars such as the popular ‘Little Lorey’ will reach around half of this. Used widely for cut flowers, Chamelaucium floriferum makes a good garden plant in an open sunny position. This is aslant that is not well suited to humid climates. Soil – Humus rich well drained. pH should be slightly acidic. Flowers – White with red centres. Old spent flower heads should be pruned way after flowering, this helps maintain a bush habit and encourages a better display of flowers the following season. When pruning, avoid cutting back into old wood.